Southern Pictures - 105 min. 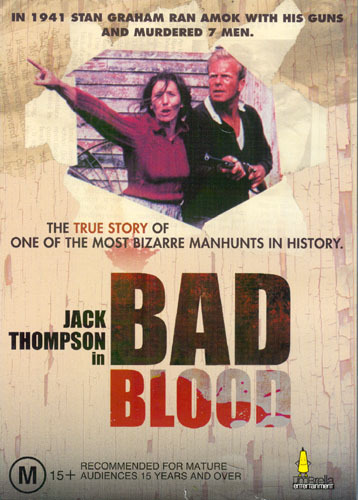 Cast: Jack Thompson, Carol Burns, Dennis Lill, Elizabeth Watson, Michael Teen, Donna Akersten, Martyn Sanderson, Marshall Napier. Screenplay: Andrew Brown (based on the book 'Manhunt' by Howard Willis); Designer: Kai Hawkins; Photography: Gary Hanson; Music: Richard Hartley; Editor: Peter Hollywood; Producer: Andrew Brown; Director: Mike Newall. In October 1941, Stan Graham, a Westland smallholder, develops a persecution complex and starts to threaten his neighbours. They put up with it for awhile but things become intolerable. One day a party of four policemen arrive to confiscate his firearms. This causes a flashpoint for him - he loves his guns and is not going to hand them over. He shoots all the cops and, in the ensuing altercations, three more locals before heading to the hills. A manhunt composed of police, army and homeguard is organised and delivers Graham's come-uppance. Based upon a true event that happened around the present community of Kowhitirangi, out of Hokitika. New R0 PAL DVD copies are available for about $20au or $20nz. The DVD is listed as 1.85:1, 2.0 dolby stereo, but I measured 1.67:1 and to the best of my knowledge, it was filmed 1.33:1, mono. There are no subtitles. The DVD includes a 15 min. interview with Jack Thompson. The DVD video quality does not appear much better than a clean VHS - in otherwords the movie looks like it was shot on 16mm, instead of the 35mm upon which it was done, however read the information below about the dvd transfer before ruling out getting or seeing it. VHS copies are available in both PAL and NTSC formats, but no known sources for new copies. Expect used copies to sell for at least $15us. NOTE: As of 2 Oct. 2007, it is available from North American sources for about $22.50us, however I have yet to see a copy or hear about its extras. I would appreciate someone with such a copy to let me know if it is widescreen, mono, stereo and possessing any extras. Aro Video of Wellington has a DVD copy for rent to any New Zealand address. No known soundtrack of this title.